How many hours have you spent perfecting your details – and then tracking them down when you need them? What if you could cut that time to a fraction while still ensuring accuracy? Our software will completely redefine the way you work with details. From initial drafting to scaling (and rescaling) to the inevitable eleventh-hour edits, our detail system streamlines the entire detail-building process. 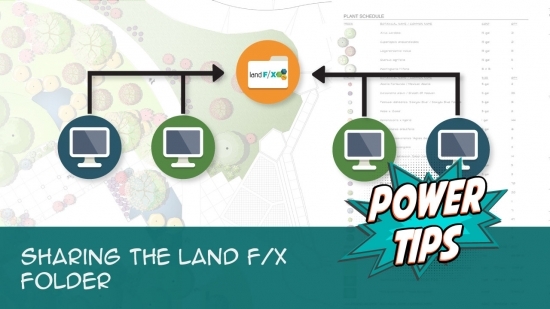 If your office uses details, Design F/X is a no-brainer. 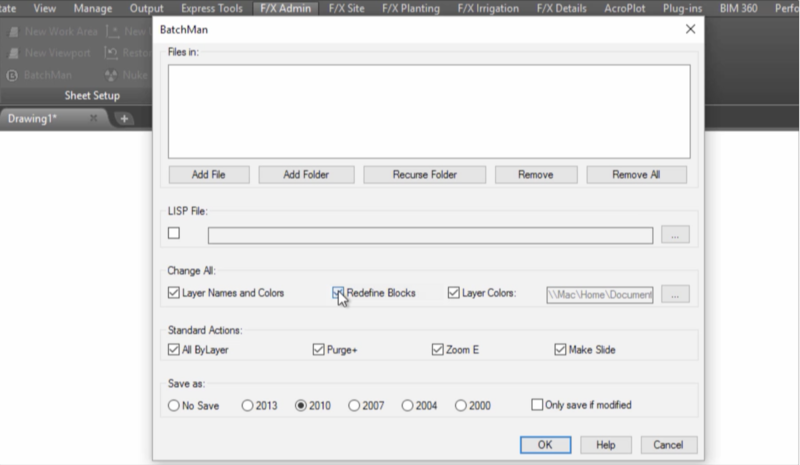 Design F/X is the detail-processing powerhouse that forms the core element of our software. Organize your office’s standard details into a central storage system, accessible from CAD by multiple users. Draft your details and place callouts and text, knowing all the while that everything will scale correctly on any sheet. Edit multiple details in a hurry, and have your changes applied automatically to your drawing and the original detail files. Callouts are updated and details renumbered automatically. It’s engineered simplicity – only from Land F/X. See our latest client-inspired features in action. We’re constantly evolving our software based on feedback from our clients. It’s how we continue to give you the tools you need to work faster and more efficiently. Each week, we produce a short Power Tip video (about 2 minutes in length, on average) showcasing our latest user–requested features. How easy is it to learn? Incredibly. 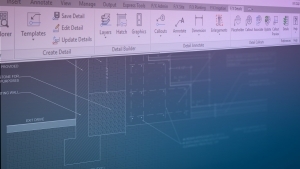 When you install our software, you’re installing a set of additional AutoCAD functions designed just for you. It’s like your landscape architecture tool belt. Need a little help? We’ve got the learning resources you need. 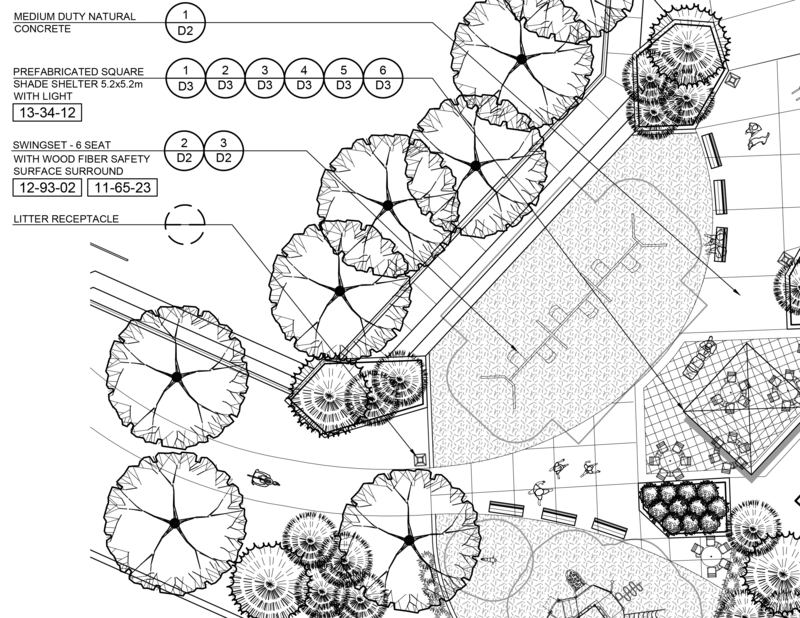 We strive to make CAD-based landscape design simple, intuitive, and fun. 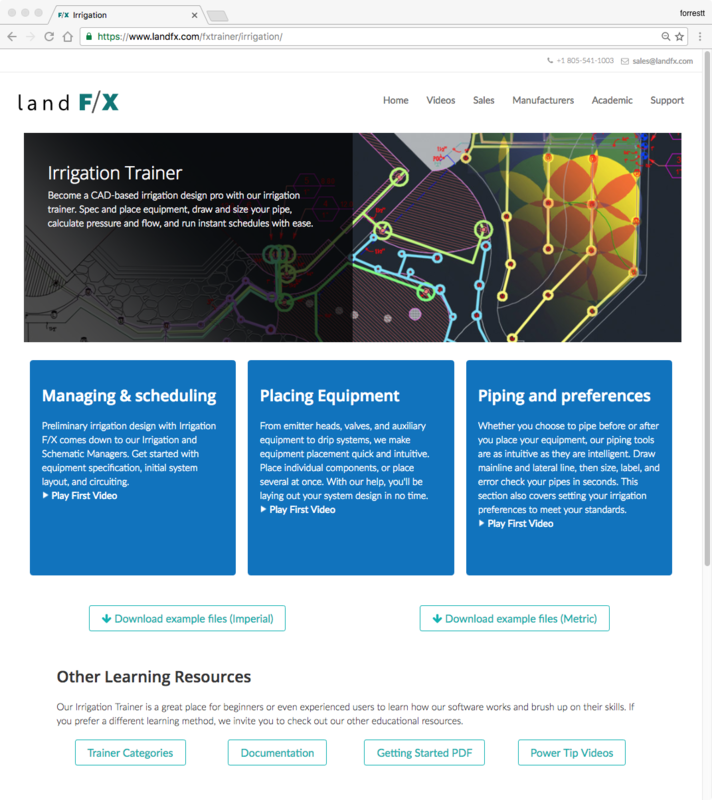 Users like you have made Land F/X what it is today. Just like riding a bike, learning our software might seem challenging at first – but you’ll be cruising in no time! Start with the fundamentals by watching our brief training videos. One step (roll?) at a time, we’ll guide you through the essential tools and techniques, from building your palette to placing plants, labeling, error checking, scheduling, and creating a dynamite presentation. Jump on! Videos are great, but nothing can replace good old-fashioned reading. 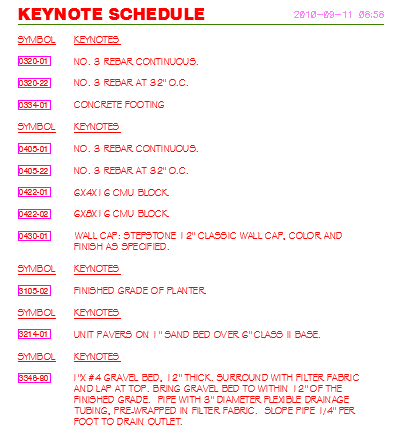 Our documentation section is extensive, meticulously organized, updated constantly, and completely searchable. 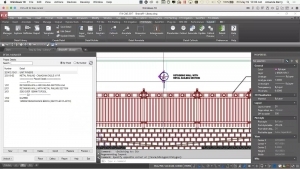 Learn all about our software and pick up some valuable AutoCAD tips – all at your own pace. Want a more in-depth look at our software? Our weekly hourlong webinars go beneath the surface to give you full immersion into techniques and best practices for Land F/X, AutoCAD, and SketchUp. Your license gets you into the live webinar. Can’t make it? We post each of our webinars on our website, allowing you to view them whenever you have the time. Never lose a detail again. 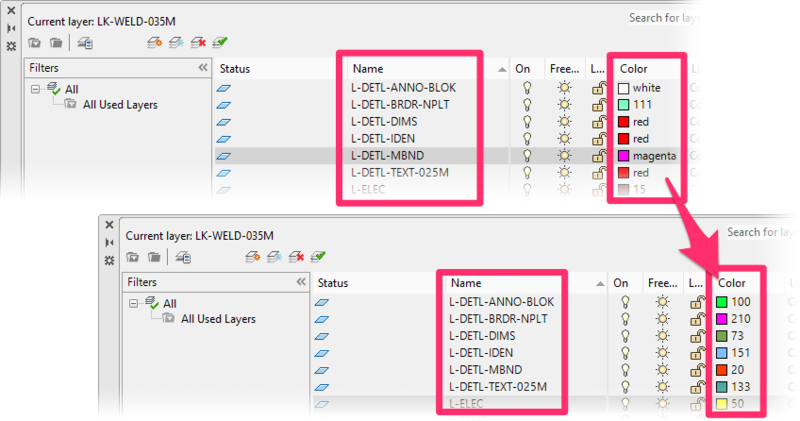 File details into a single master hierarchy, customized for your needs. Access every detail, from every project. Details can be copied, moved, referenced, edited, and printed easily, by every designer in your office. Our detail organization system is straightforward, completely customizable, and easily accessible. Even if you’re covering for a colleague who’s taking a sick day, keep tabs on your details and make sure your plans are still accurate. Don’t spend another minute tracking down lost details. 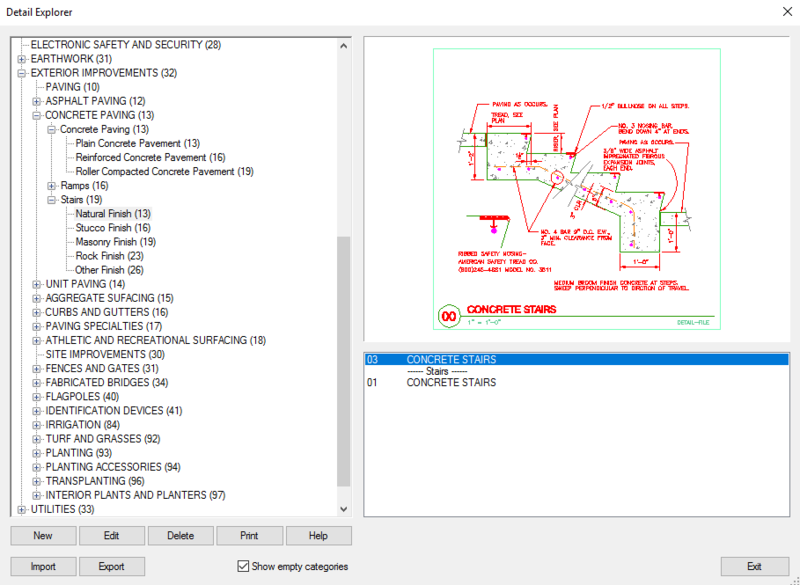 Your installation comes with a default folder structure based on Construction Specifications Institute (CSI) classifications. You’re free to use these categories and subcategories, or create your own based on how you work. Set up a detail hierarchy for your office that’s logical and easy to navigate – and not just a vague idea in someone’s head. 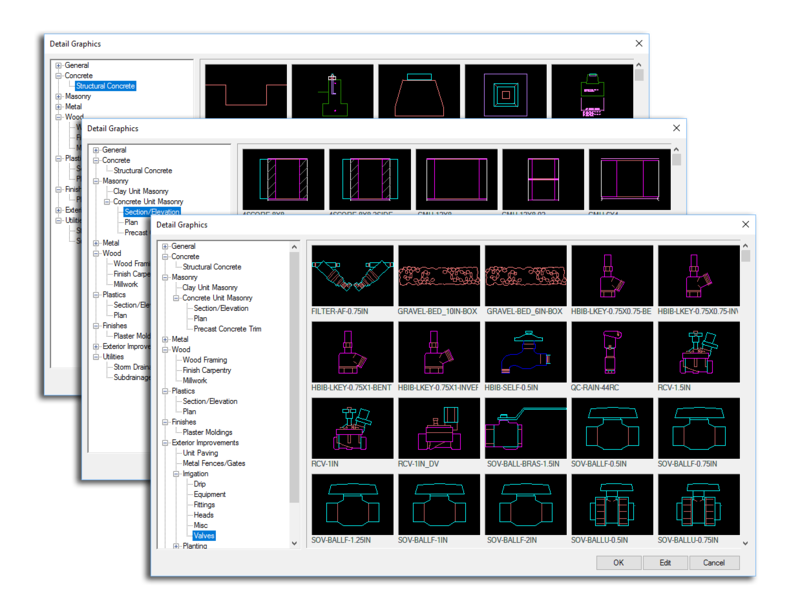 Our Detail Explorer opens your detail library from a dialog box within any CAD drawing. Organize your detail library any way you want. 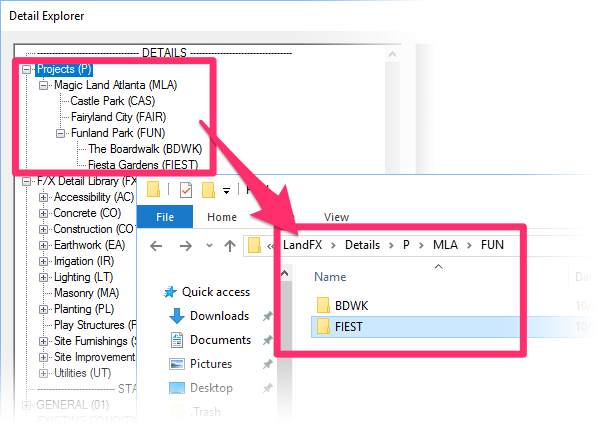 Save your details into a logical folder structure, preview them, and edit them, all without leaving CAD. We make detail creation a snap. 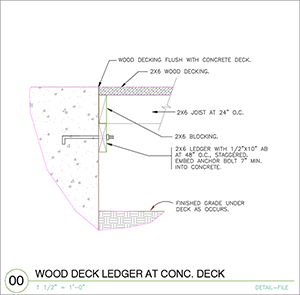 Our detail building tools make the drafting process fly by. What once took days now takes just minutes. With so many moving parts, detail creation can be a real challenge. We streamline the entire process, from blocks to layers, callouts, and text. Draft your details at 1:1 scale, save them, and place them. No more guesswork or tedious rescaling. The time savings are unmatched. You go to great lengths to maintain your office standards throughout your drawings. The details you use in those drawings should uphold the same standards. 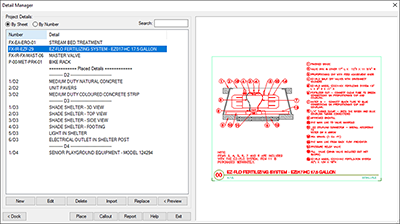 Our customization tools ensure that your title blocks, callout arrows, text, callouts, dimensions, and layers – including colors, lineweights, and names – will remain consistent from detail to detail, and from drawing to drawing. Assemble your details quickly with our extensive libraries of blocks and hatches. Choose from an extensive collection of detail component blocks ranging from wood framing, metal connectors, and concrete trim to site furnishings, structures, and vehicles. You can easily edit our default blocks to your preferences – or add your own blocks to the software, where they’ll be ready to place in a detail. Our default template size is designed to fit multiple details on a single sheet. If you want, you can set your own default template size to match the way you work. Assemble your details quickly with our extensive libraries of blocks and hatches. Choose from an extensive collection of detail component blocks ranging from wood framing, metal connectors, and concrete trim to site furnishings, structures, and vehicles. You can easily edit our default blocks to your preferences – or add your own blocks to the software, where they’ll be ready to place in a detail. 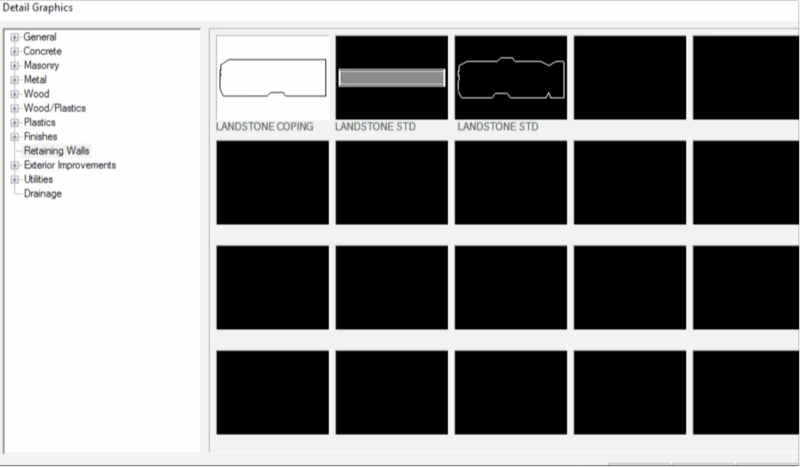 Add hardscaping and other materials to your detail using our hatch libraries. Hatches retain their original density at different drawing scales. Enlargement sections provide a great way to show a close-up view of one portion of a detail. Keeping the dimensions consistent between detail and enlargement can be an uphill battle. Our Detail Enlargement tools make this process fast and foolproof. Just grab a section, toggle to your desired scale, and place the enlargement. Round out your details by adding dimensions, text, and callouts. Our annotation tools give you a variety of options for creating clear and meticulously crafted details. 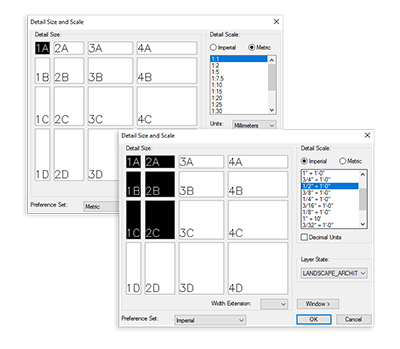 Set any scale you want in your drawing – the text, dimensions, and callouts in your detail remain the same size as the blocks and linework scale up or down. 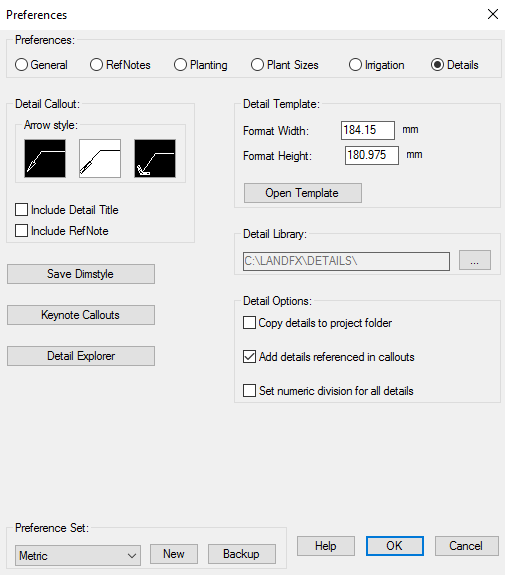 Add hardscaping and other materials to your detail using our hatch libraries. Hatches retain their original density at different drawing scales. 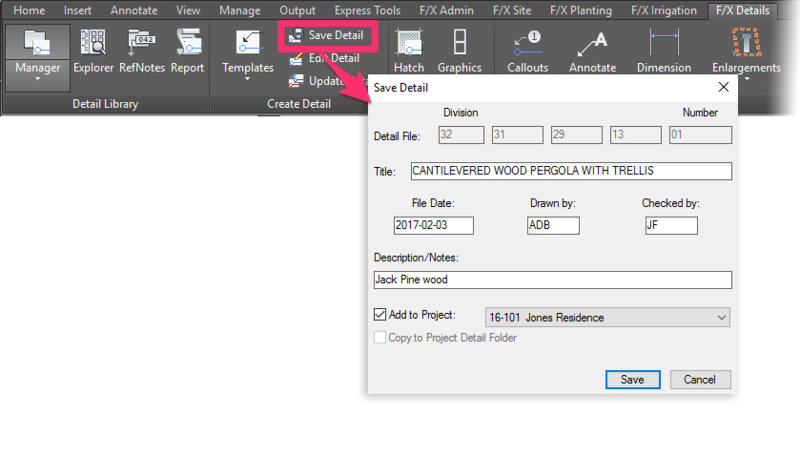 Once you’ve drafted your details, use our Save Detail tool to save them where you want them – and find them quickly. Create multiple details on one sheet, and save them instantly. 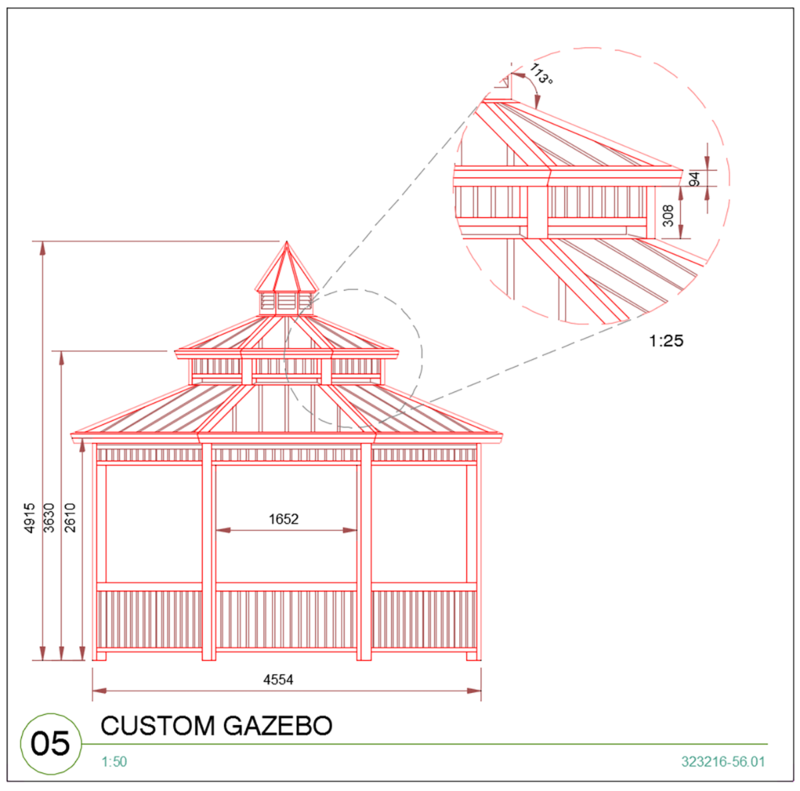 The details will be numbered, stored, and easily available to place in your drawings. Place a detail across multiple sheets, and keep the same scale without missing a beat. Once placed in a detail, blocks are scaled automatically while hatches, blocks, callouts, and text remain standardized. Stop punching numbers into a calculator to scale your details – we’ll do the work for you. The ability to use the same detail at different drawing scales is crucial. That’s why we’ve built a detail system with automatic rescaling, taking away the need to draft your details at Paper Space scale. 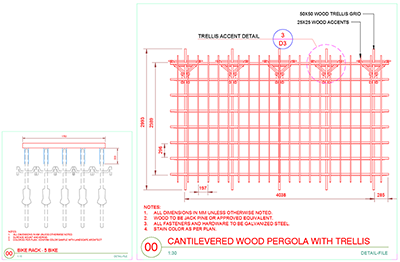 It starts with establishing a scale for your detail using our Detail Template tool. The template becomes a detail title block that’s also a “smart” scaling engine. 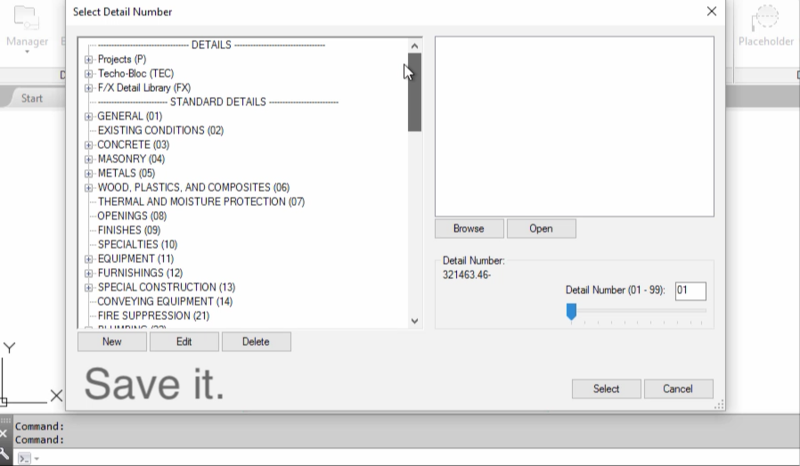 Then, when you place your details on multiple sheets, your detail blocks will conform to the new scale while your hatches, callouts, text, and dimensions retain their original scale – no calculator required. Get your details into your drawings – fast. 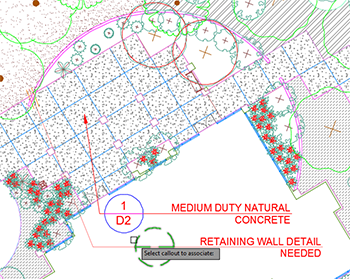 We make it unbelievably easy to access all your standard details and use them in your landscape plans. 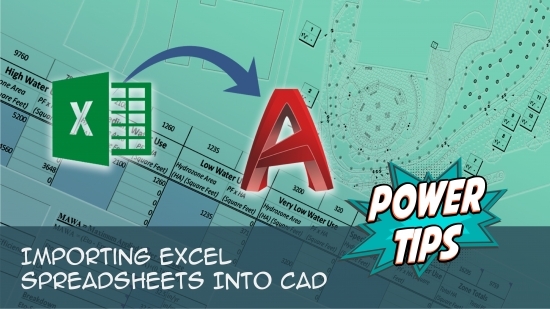 Just open a dialog box in AutoCAD, select your details, and place them into your sheets. You have tons of details, and you use them a lot. Keep it simple. 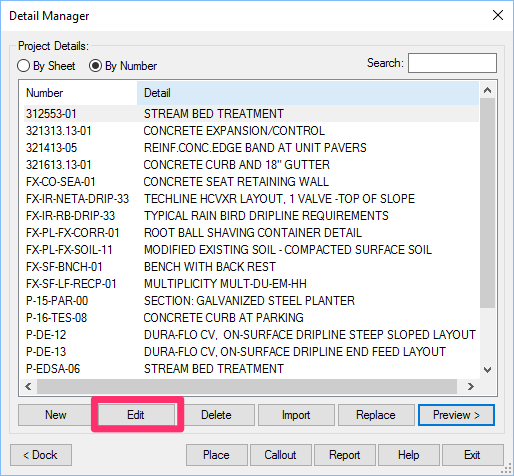 Use our Detail Manager to reference any number of details across any number of sheets by any number of users. 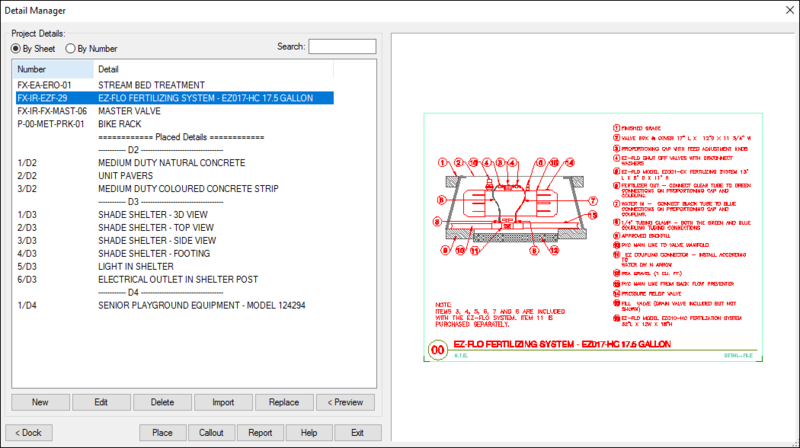 It’s a one-stop shop for compiling all the details you want to use in a project, editing your details on the fly, and placing them in your drawings. Quickly import details as you need them. View your details by sheet or by detail number, and see a thumbnail preview slide of each detail before you place it. Place a detail in Paper Space by clicking a button. 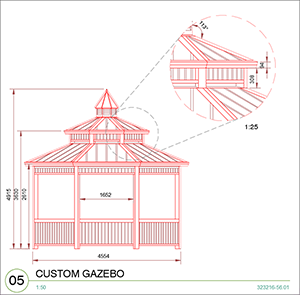 Get your details into your drawings fast, and get back to designing. Place detail callouts within details, within schedules, and within layouts. Every reference updates automatically when you make changes. 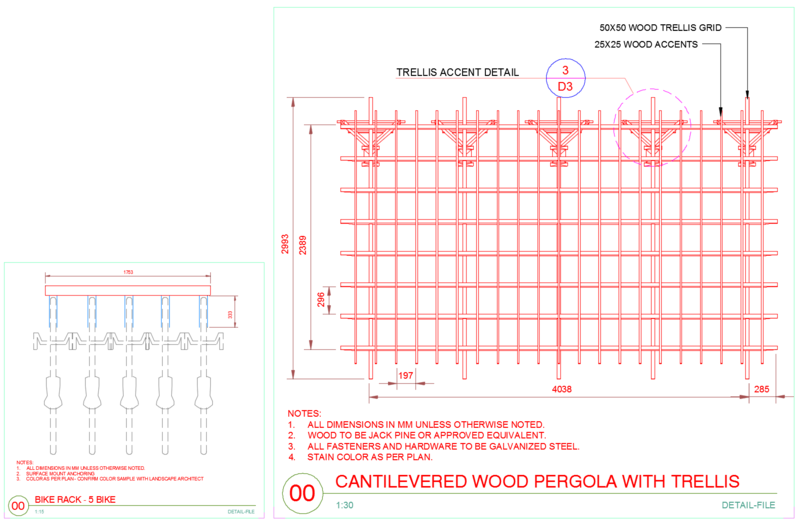 Want to look through your project details while still working in your drawing? Dock the Detail Manager off to the side. Turn it back into a regular dialog box with a click. 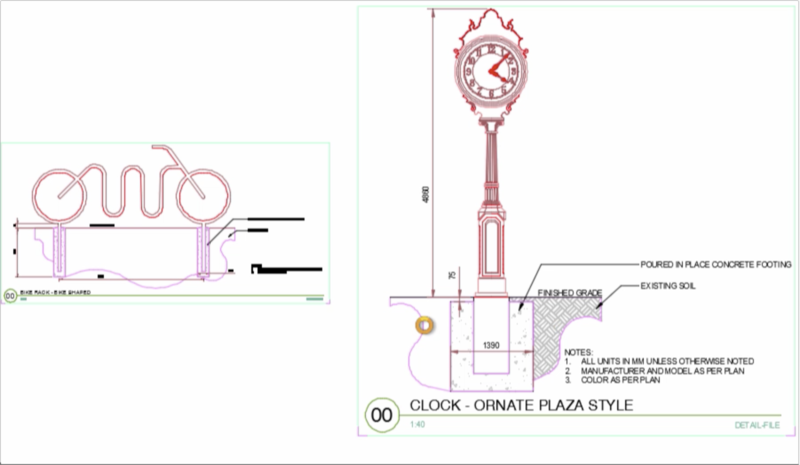 Let’s face it: Detail annotation in AutoCAD is kind of a hassle. First, you place a callout manually. Then you place the leader. Then you flip through your pages to figure out exactly what you’re calling out, find the reference number, type it in, and hope you got it right. One down, 50 (or more) to go. Then there’s the inevitable rescaling, revising, and renumbering. What if you could do it all in a few clicks – plus keep all your callouts accurate when you have to edit or move a detail? We make it so. We wouldn’t recommend counting the number of hours you’ve spent adding callouts to details. Suffice it to say that with our help, that number will shrink drastically. 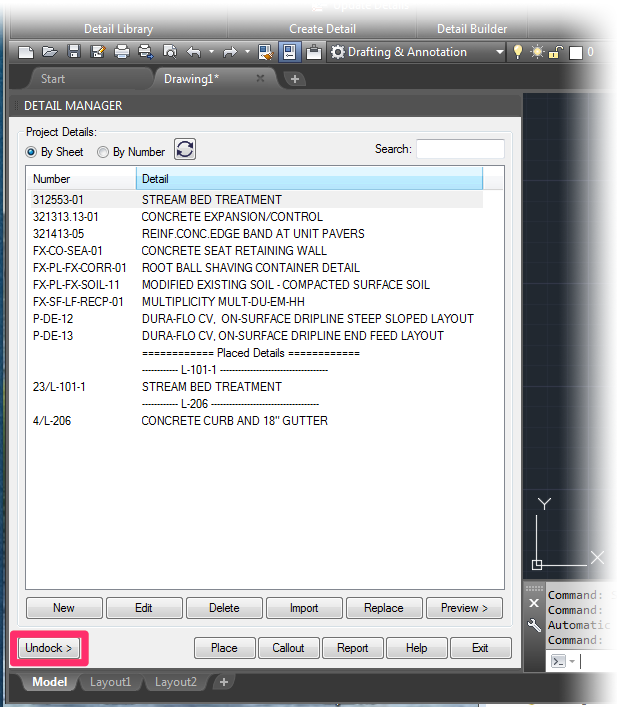 Our detail callout tools make the entire process simple and clear: Click a button to choose which detail to call out. The detail’s number and title are added automatically. 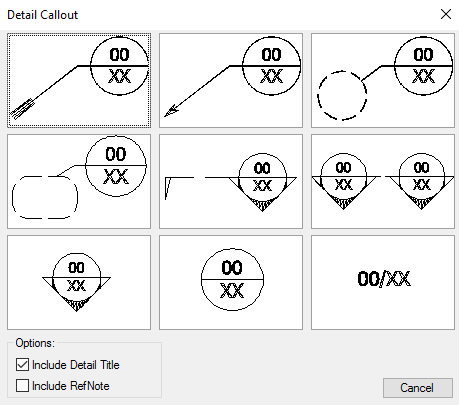 Use our Detail Callouts tool to call out a component of your detail, or call out a detail in your drawing. Choose from a variety of label and leader styles, and even place a blank callout as a placeholder to be edited later. Don’t know exactly what you need to say with a callout yet? Use a Callout Placeholder, then associate it with a detail later. Revisions are a constant, and massive changes can turn chaotic quickly when you have a lot of callouts. Never fear. 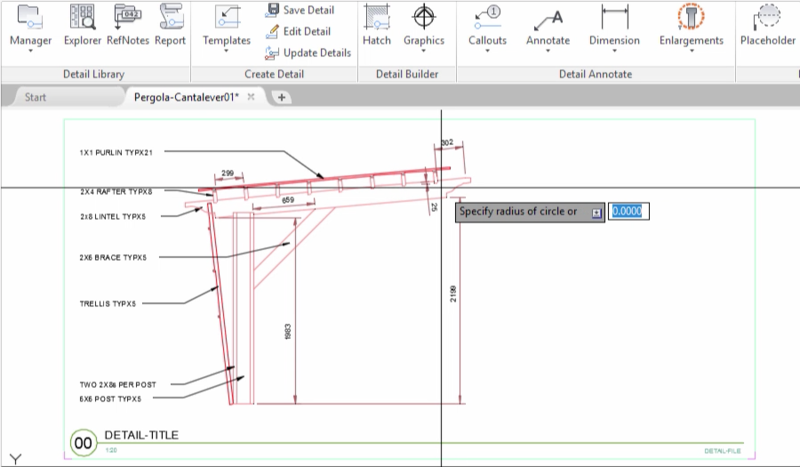 Our Update Callout tool cements your changes across multiple details, sheets, and drawings. Bubble Callouts automatically keep track of number references and where you’ve used them. They’re great for saving space and reusing repetitive text, and they make it easy to translate details into different languages. Keynote Callouts act as master detail references that you can save and apply to several different details. Create the callout once, and reuse it wherever you need it. 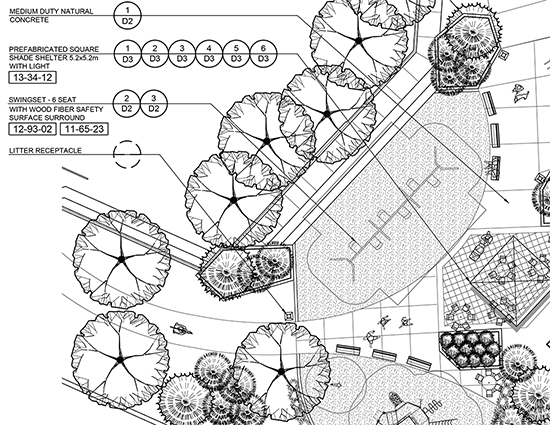 Details need to be edited and updated – it’s just a fact of life for any CAD designer. We make it painless. You’ve been there: You create several pages of details, only to be told by your supervisor that they all have to be rearranged in a different order, with another page of details in the middle. Or you’ve used one of your typical details in multiple projects, but some of the detail’s specs have changed. No worries – just relax and make your changes. We’ll take care of the rest. 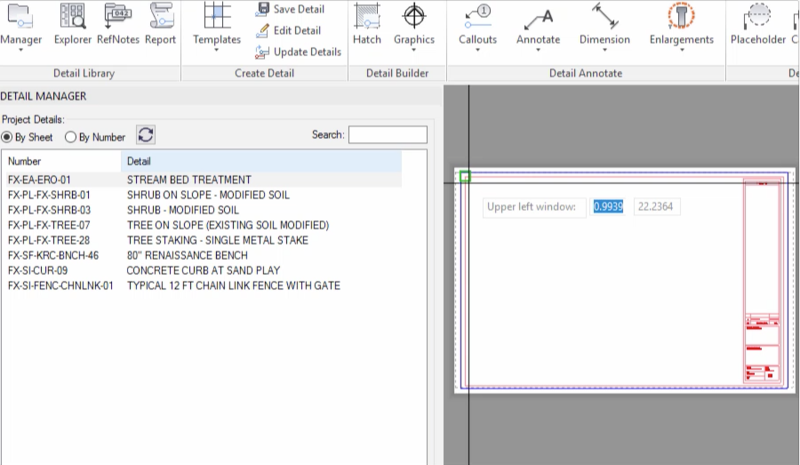 Select a detail from a dialog box in CAD, and click a button to edit it. 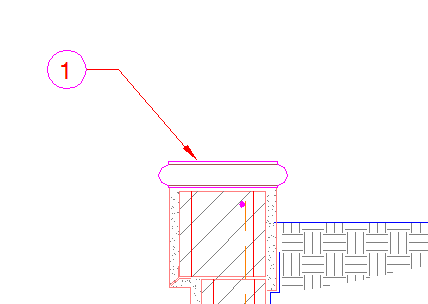 Or open our Edit Detail tool and select a detail you’ve placed in your drawing. Make your edits and save your changes. You can overwrite the existing detail with the new version, or save the new version as an entirely new detail with a new number. Each time you open a drawing where you’ve placed details, our Update Details tool goes to work refreshing to the newest versions. Details renumber and callouts update – all automatically. It’s like having an assistant verifying that everything is good along the way. You can also update your revised details manually as you work. What about your standard details? If you’ve used them in drawings already, you’ll have to edit the original and placed versions separately, right? Nope. With Design F/X, they’re one and the same. Edit the originals and the placed versions update (if you want them to), just like that. 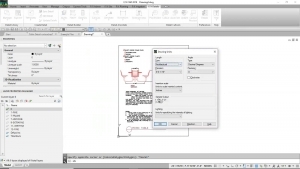 Instantly apply your standards to all your details or drawing files. You’ve taken the time to develop a consistent set of standards – now you need to get those standards into your files. Or you just need to make the same change to multiple files. Our BatchMan tool makes it all happen with a click. Batch it & forget it! 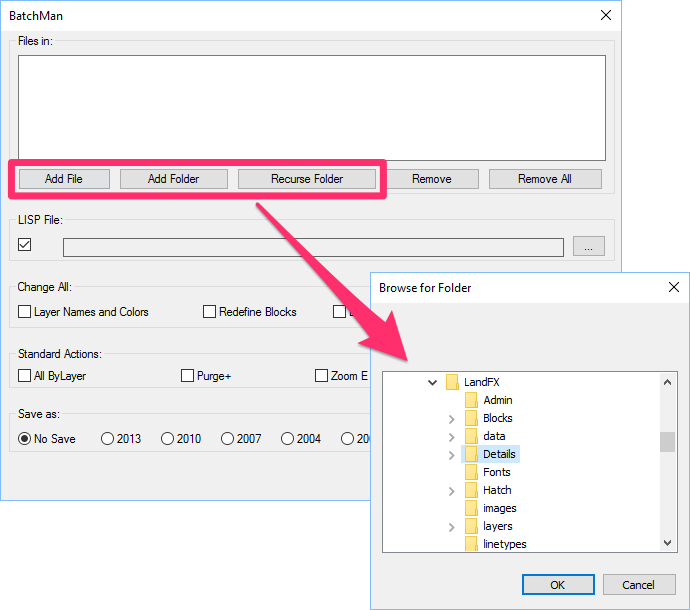 BatchMan is a batch file-processing tool that helps you make the same changes to a whole folder of files – or a folder of folders of files – all at once. 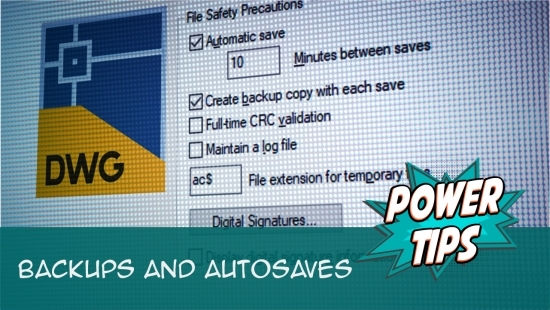 Just tell BatchMan what you want done in which files, and click OK. Bam! 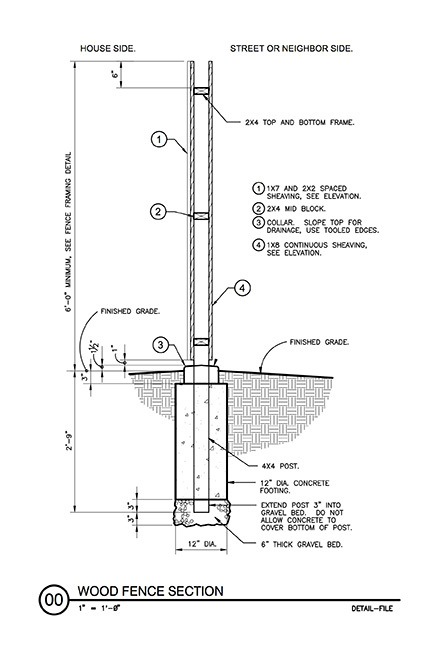 Your standards are enforced across all the drawings and detail files you selected. 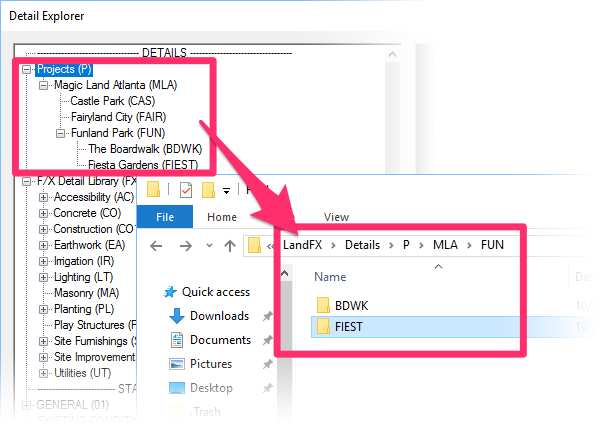 Browse to the files or folders you want to process. Run your own LISP file on all the selected files. Change the layer names and colors, or just the layer colors, to meet your standards. 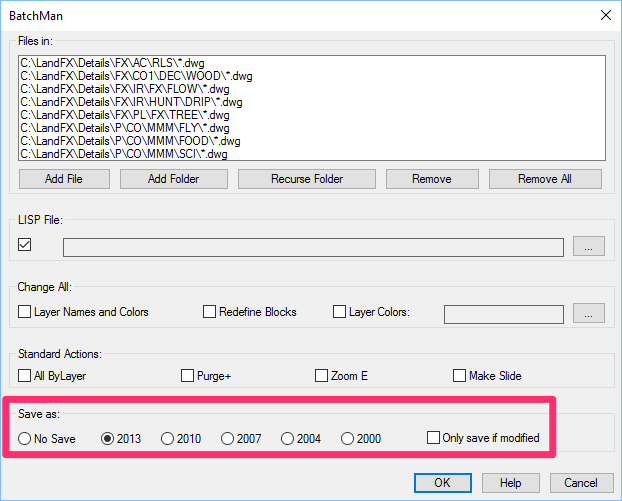 Update (redefine) all blocks in all the selected files to the latest versions of those blocks. Set all objects and linework to the ByLayer setting. 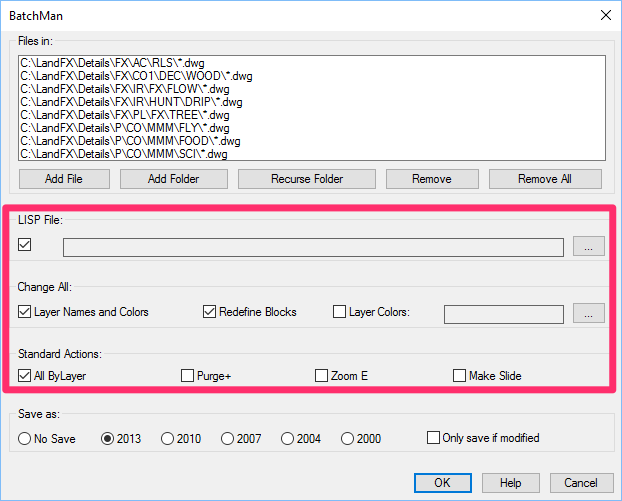 Run the AutoCAD Purge command three times on each file to get rid of all unnecessary and unused lines, fonts, layers, and blocks. Zoom each file to Extents. Shoot a preview slide of each file – an especially handy feature for a batch of detail or block files. 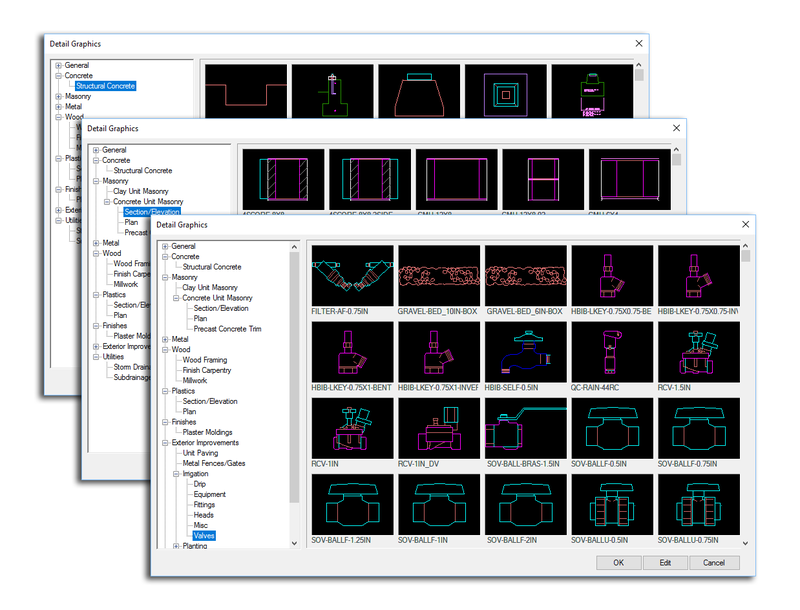 Save all your files in the DWG format of your choice. Or select the No Save option to preview your changes without saving. BatchMan can process about three files per second on a fast machine, and can easily process 1,000 or more files at once. Click OK, and watch BatchMan fly through your files. There’s simply no faster way to make these types of changes at once – like your layer colors – across as many files as you want. 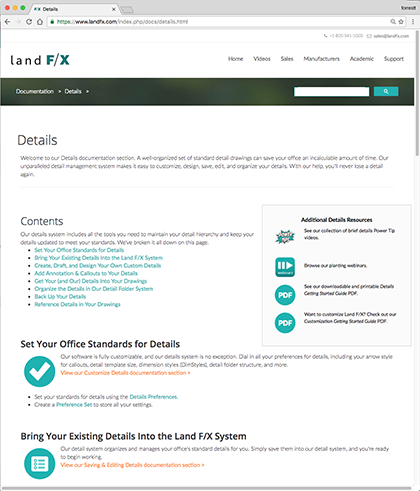 Sign up now for a free trial to find out exactly why Land F/X is right for you.